First let me begin by hinting that there is no mistake, as this band consists of 16 members playing various of instruments. Assumingly this variety will conjure a thought of a kind of Progressive type band, or to be precise it’s Progressive Rock Orchestra. The band, or should I say Orchestra, already released three albums and this is their fourth album. If you are familiar with the “Lord Of The Rings” series of books or movies, depending on your favorite media, the name AINUR comes out from the books, spiritual beings that were before humans and elves. However it’s off topic here therefore I suggest on reading “The Silmarillion” for better understanding, this is the Middle Earth bible. 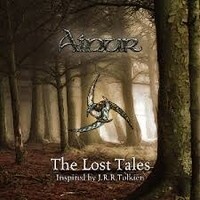 As for “The Lost Tales”, it is a compilation of stories from the “Lord Of The Rings” and “The Silmarillion” books; I can’t review the album song by song because I think it should be heard as a full composition. So I will share my thoughts for the entire album as one. There aren’t any Metal oriented parts here or even distortion; however I consider this album to be a Progressive Rock prominence, mainly due to the structure and the use of many acoustic guitars. Generally it’s a great listen and I was amazed that I have never heard of the band, particularly as a huge big fan of the “Lord Of The Rings” books, and Fantasy in all aspects. The album sends you directly to the book and movie parts, letting you feel the wilderness and woods of the middle earth. The vocals are amazing, can’t pinpoint the vocal specific since the lineup has plenty of voices and singers, however it is still awesome. In overall, this is an amazing experience even though it’s not a Metal album. It’s a well formed Progressive Rock experience. I’m pretty sure that attending this band’s live on stage is an amazing phenomenon and I should try and do so. In the meantime, I will listen to them at home in full volume and let myself drift to the Middle Earth land thinking I’m an ranger piercing enemy skulls with my arrows.